Face Acupuncture is a needling technique consisting of a therapeutic treatment of face points with needles and other means, based on rational observations according to anatomical comparative approach applied to acupuncture research. 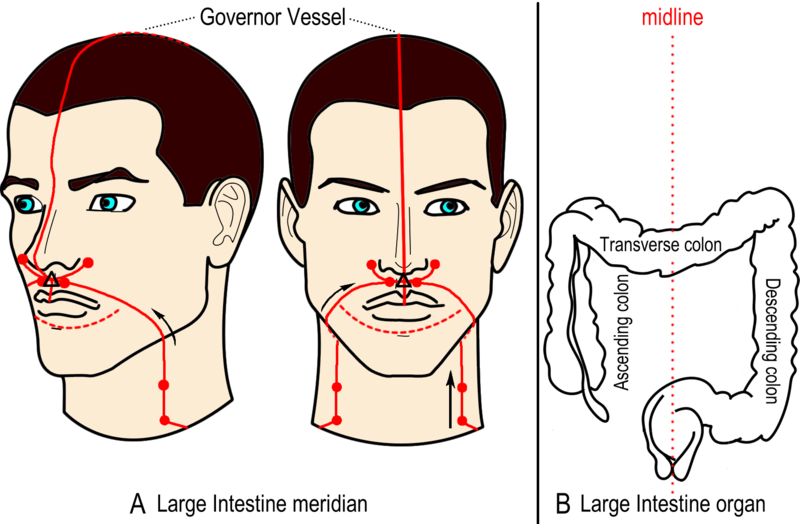 As you can see in the picture above, the large intestine meridian of acupuncture draws around the upper lip, at the nose-wings side and along the neck, the same shape of the real organ. These observations tell acupuncturists about a very simple correlation: in adult life the face and its sensorial organs are an equivalent of the umbilicus and umbilical cord in embryonic and fetal life. During the embryonic life, in fact, the face develops along with all organs of the body, but organs do not still function completely because the embryo makes all exchange with the environment not directly, but through her/his mother via the umbilical cord. This apparatus is a circulatory temporary cable connected to a filter, that’s placenta. The umbilical cord furnishes the embryo with the aliments and oxygen digested and inhaled by her/his mother. For this reasons we can consider the umbilicus an elementary, provisional face. When an individual is developing in the maternal womb she/he has no need to harvest fruits and hunt preys, neither to drink and breath. At the same time the embryo must not escape from predators directly, because the mother does it for her/him. So the embryo’s senses, respiratory and digesting apparatuses are not active. They will be built during pregnancy and begin to be active when a completed baby will be born and sent outside, into the arena of life. The complex steps of large intestine development, as shown in the picture above, consist of a physiological invagination of the lower tract of the primitive stomach into the embryo’s umbilical cord, then a 270° counterclockwise rotation of the cecum bud around the upper mesenteric artery, which gives origin to the definitive large intestine: the same shape of the large intestine acupuncture meridian on the face. 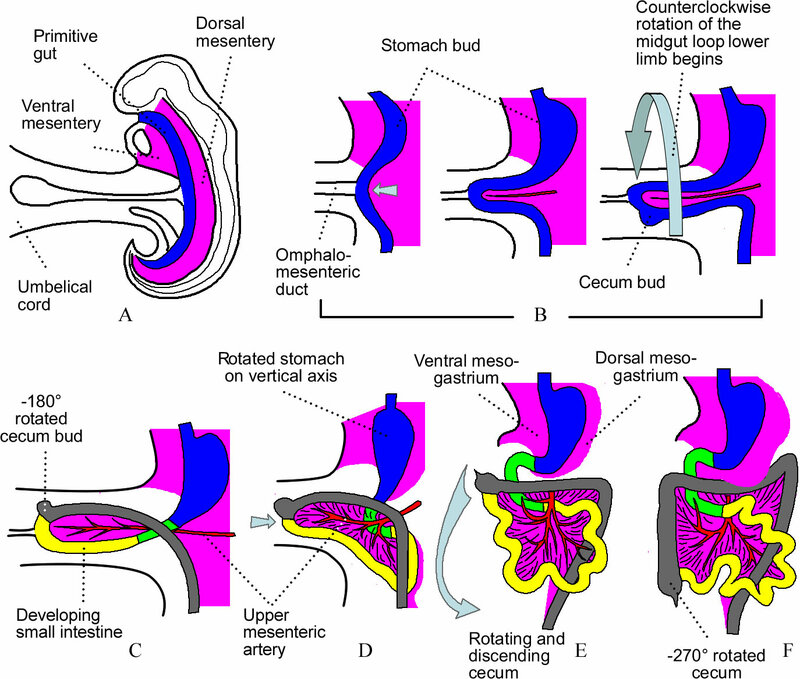 The complex steps of large intestine development, as shown in the picture above, consist of a physiological invagination of the lower tract of the primitive stomach into the embryo’s umbilical cord, then a 270° counterclockwise rotation of the cecum bud around the upper mesenteric artery, which gives origin to the definitive large intestine: the same shape of the large intestine acupuncture meridian on the face. Stefano Marcelli introduced the anatomical comparative approach to acupuncture research. This is weird because the most acupuncturists of the past, who imported the acupuncture into the medicine practice of western countries, were medical doctors, as well as many acupuncture researchers of recent times, that means professionals with basic knowledge to special skills in human anatomy. By the way… The (quasi) complete collection of Dr. Marcelli’s anatomical discoveries finds at www.geneticacupuncture.com. The first “scientific “article on two of those observations are published on Medical Acupuncture of February 2013. 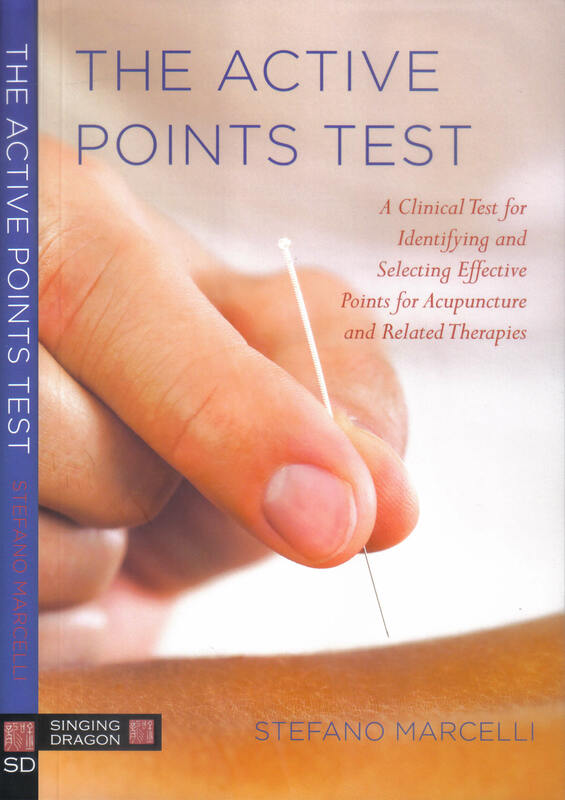 The Acupuncture Meridian System (AMS) though has never given science conclusive proofs of physical existence. Nevertheless, the comparative approach has revealed a consistent possibility that the AMS is both a morphogenetic and phylogenetic structure, that’s an invisible apparatus of unknown plays a role in the shaping of individual and species bodies animals, or at least of vertebrates.